"Now This Is Some Amazing Furniture!" Have you ever played with one of those wooden puzzles? You know the ones that might be shaped like a cube or box and there are intricate wooden pieces that you have to figure how they connect to create the original shape? What was so cool about them were the beautiful colored woods so smooth and the challenges of figuring out where they go! 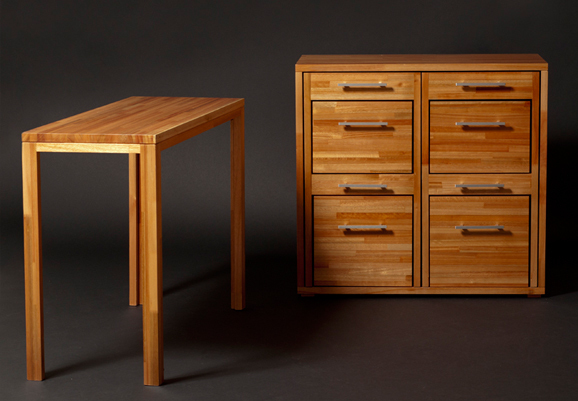 It is amazing to see this simple “sideboard” looking piece of furniture and watch how it transforms into a desk, two chairs and a file cabinet. 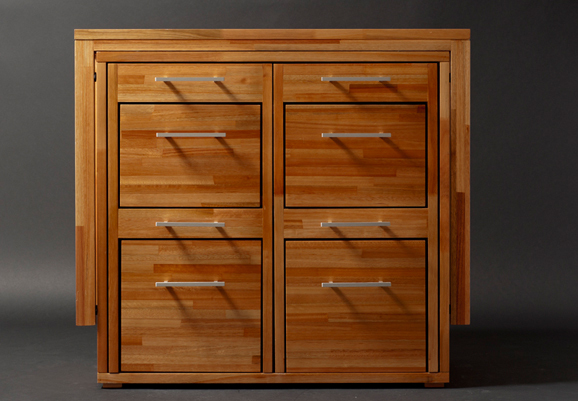 I love the attention to detail where the backs of the chairs has the same pull handles so when placed back into the cabinet it lines up as if there are multiple drawers. 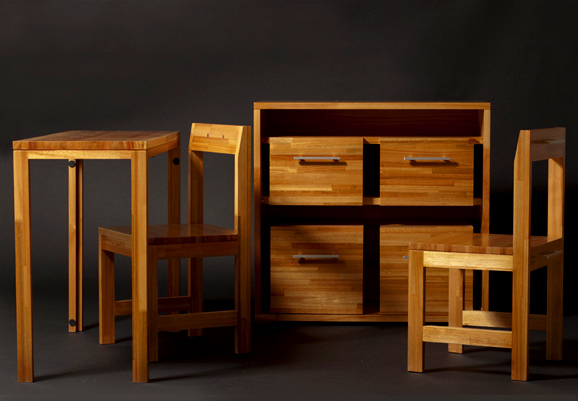 His expertise is furniture and more specifically how to create furniture that is fully functional in limited spaces. 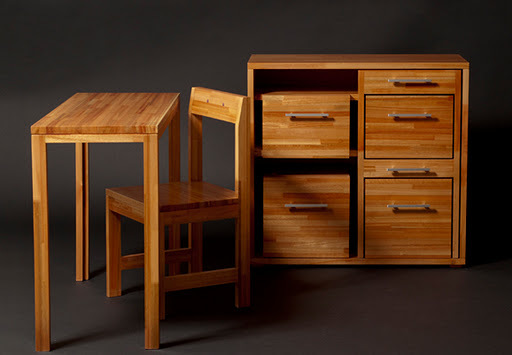 Claudio has been recognized and selected in furniture design contests and you can see why he will be someone we will see more and more of in the future. 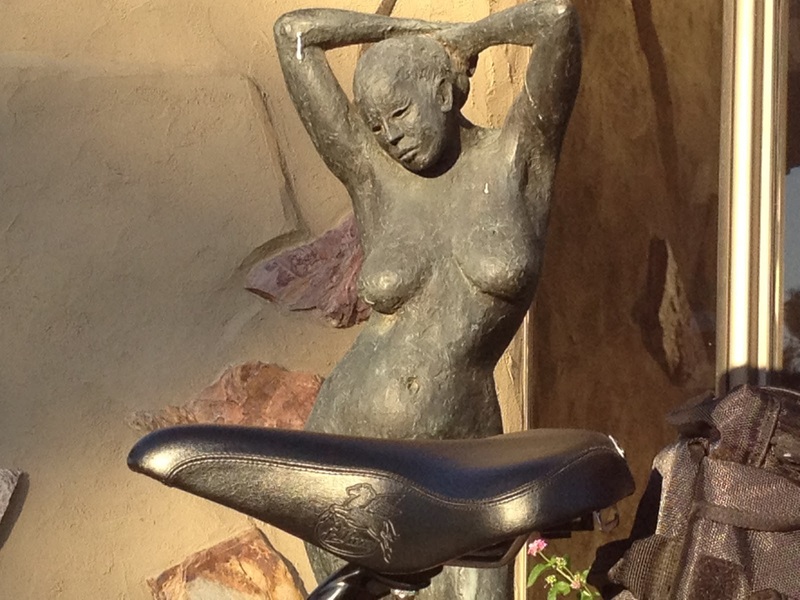 Be sure you check out his website….awesome pieces and other neat furniture ideas. 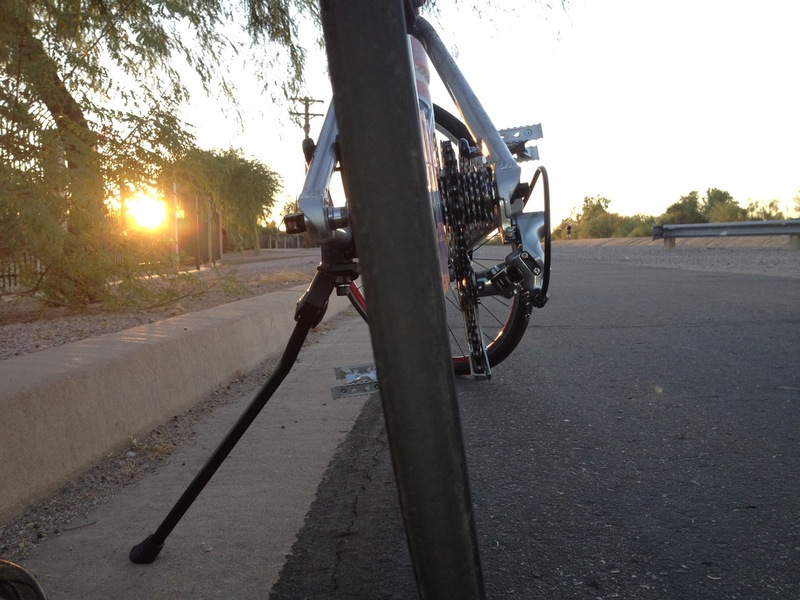 You never know what adventure the ride will bring…. When we set out his morning, we stopped at the gate to decide where we wanted to ride? More to the point, it was a debate over who had the best coffee. Initially I had wanted to pick some place new. A place that might afford us a change in scenery. 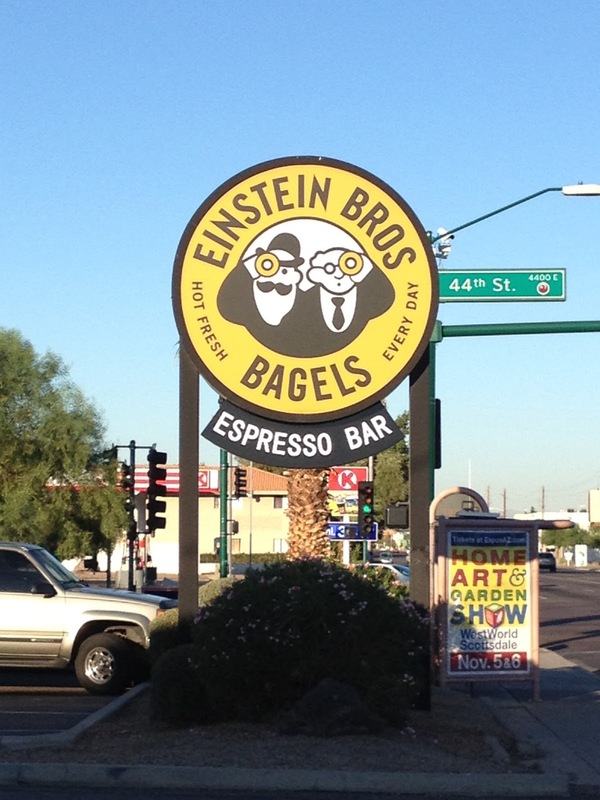 Ultimately we agreed on one of our usual hangouts (Einstein’s Bagels) because we love their coffee. We did however, decide to explore a new route. Treat #1. 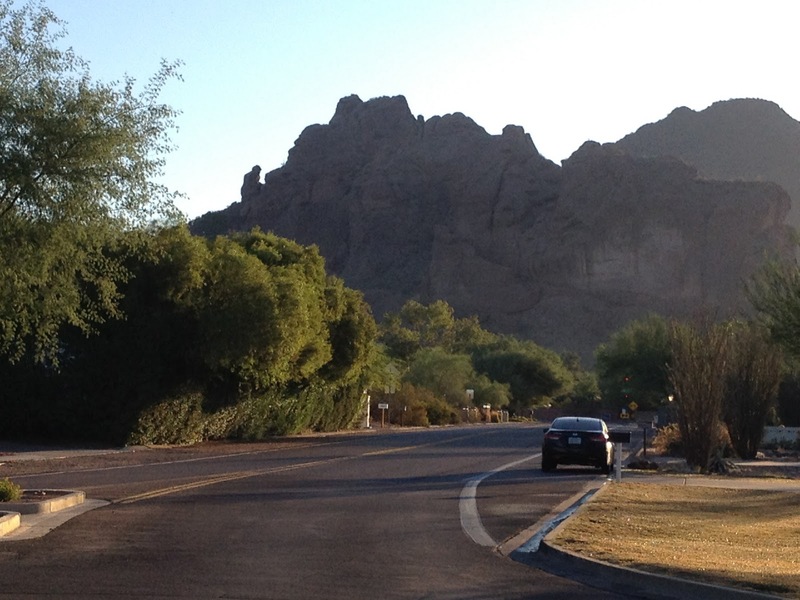 The first leg of our trip had us riding directly towards Camelback mountain. The “Praying Monk” was looming larger and larger as we continued on our Easterly course. We rode almost to the base of the mountain. In all my years here in Phoenix, I’ve never been this close to the Monk. I thought the next leg of our trek was going to be bit boring as we were riding down the sidewalk, next to the main street. Not too much excitement here. 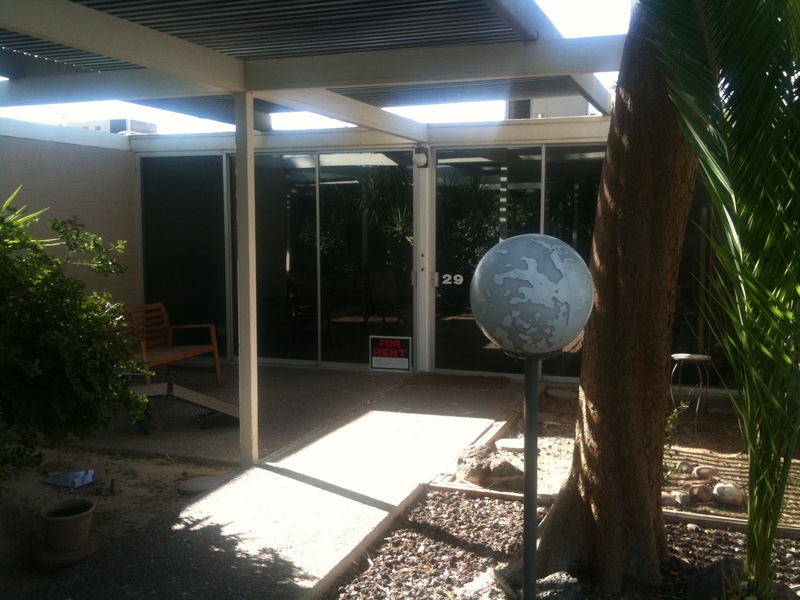 At the first stop-light, Shawn made another route suggestion and had us cut through the Chase parking lot at 44th street and Camelback (a gorgeous Mid-Century Modern building.) 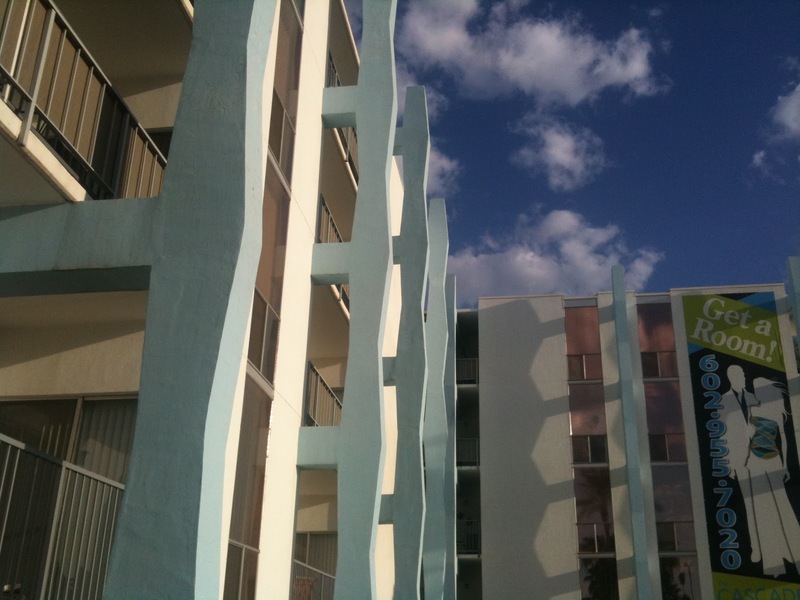 We’ve ridden past here a thousand times and admired the architecture. 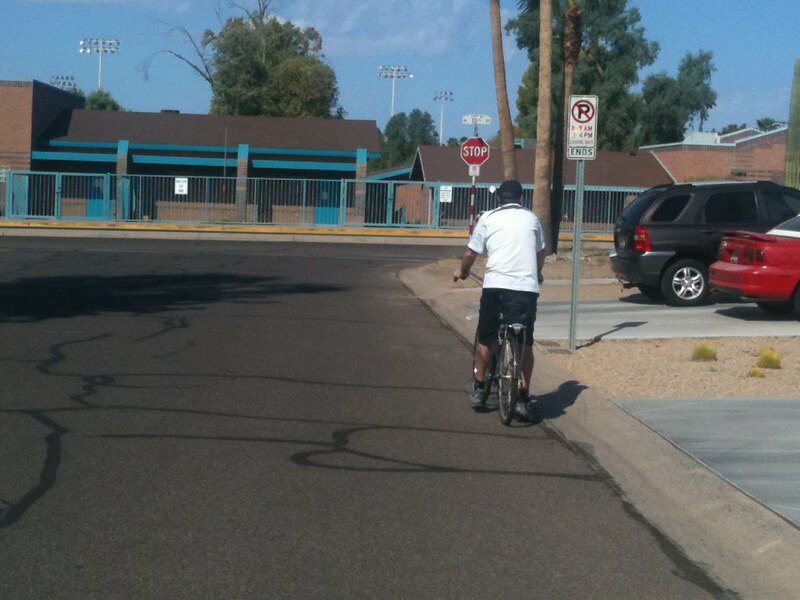 Today, since it was Sunday, we were rode on the actual customer sidewalk. Treat #2, a naked lady! 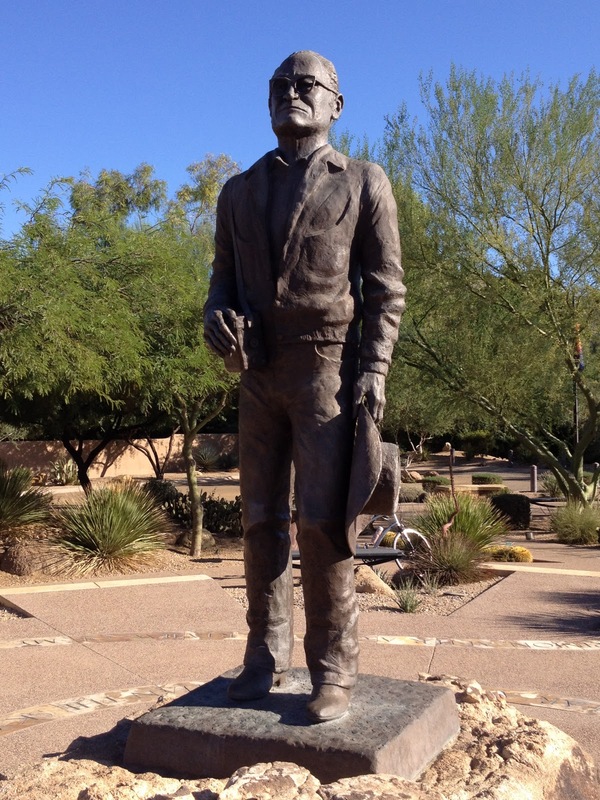 Well, a statue of one anyway. There are several statue’s surrounding the perimeter of the bank. I’d never noticed them before. 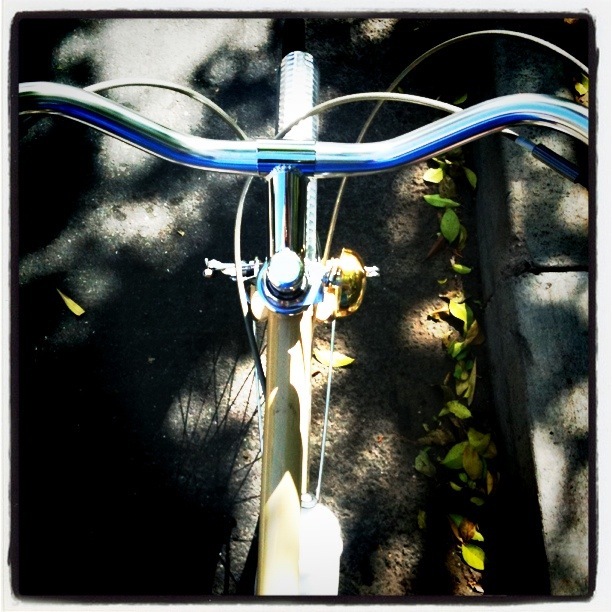 You see the most wonderful things from the seat of a bike! A short time later, we reached our coffee stop. Over breakfast we planned out the return route. We were pretty sure where the road would take us, but had never driven/ridden this particular stretch. As we were riding along, enjoying the scenery we pulled up short! Treat #3. We discovered the coolest statue I’ve ever seen. 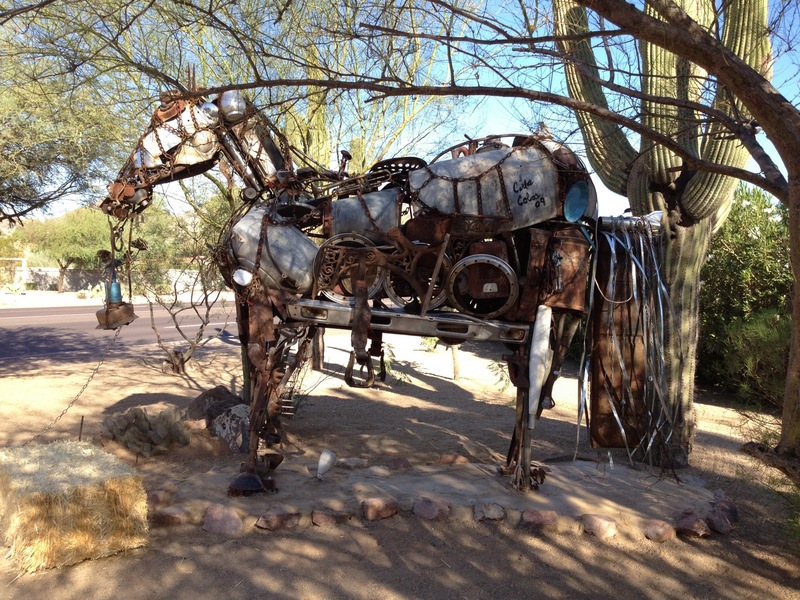 A life-sized horse made out of every imaginable salvaged item. The individual pieces were not very big, but together they formed the horse. There was even a fresh hay bale! We spent a considerable amount of time examining the statue from all sides. It was fascinating! Back on the bikes and we continued on our way. Shawn’s guess was correct. We ended up at the intersection of Lincoln Drive and Tatum Boulevard. Treat#4. 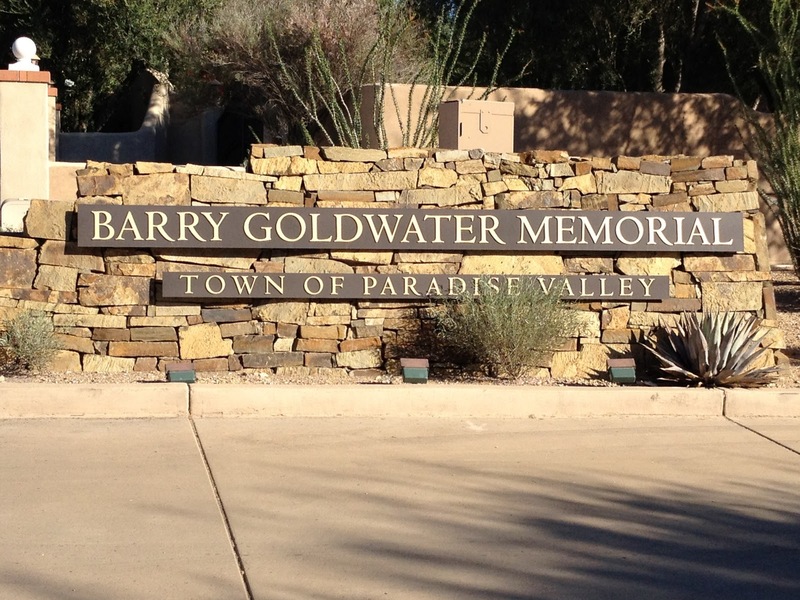 We stopped off at the Barry Goldwater memorial. It’s pretty cool. Back on the bikes and heading for home. We had a very fun ride along Lincoln Drive, up and down the hills. What started out to be a routine ride for coffee, turned into a great adventure. 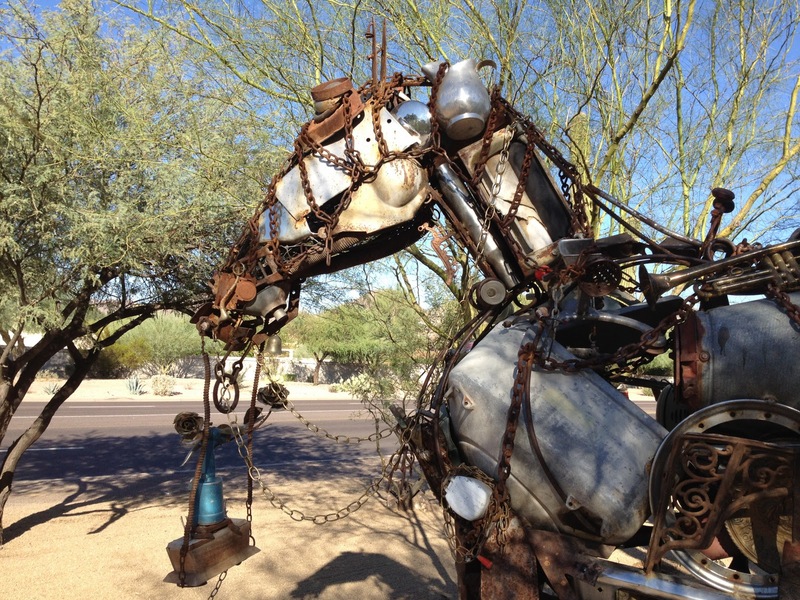 An unexpected ART ride! By throwing the planning out the window and looking for any route but the usual, we were treated to some very cool surprises. This was by far the most fun ride we’ve taken in a long time. It just goes to show that you never know what adventure the ride will bring. Since we wanted to make this big change in reducing clutter and STUFF…we also wanted to live a simpler life where we live in a more urbanized community where it is easy to walk or bicycle to a favorite destination. 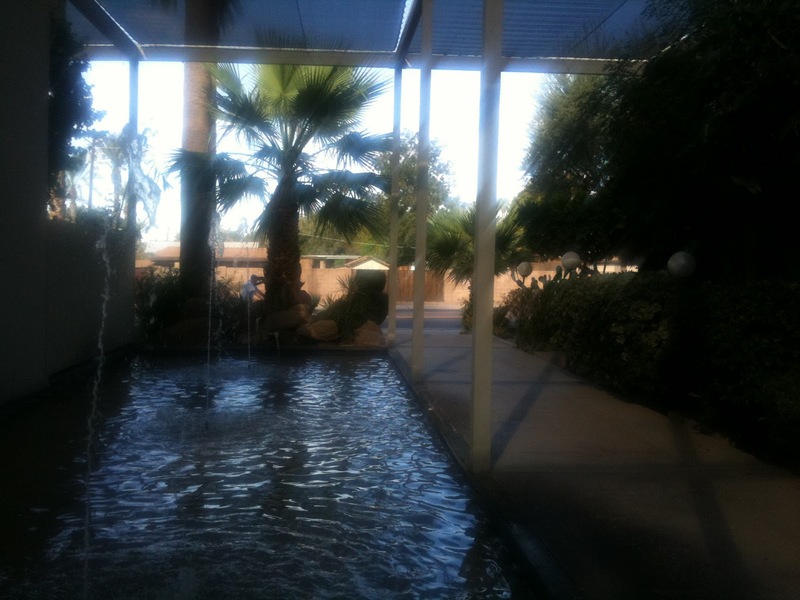 And where we live….we couldn’t be happier and enjoy that every chance we get. (When it isn’t 110+ degrees outside). We were so excited this weekend as it hit only a high of 99 degrees! 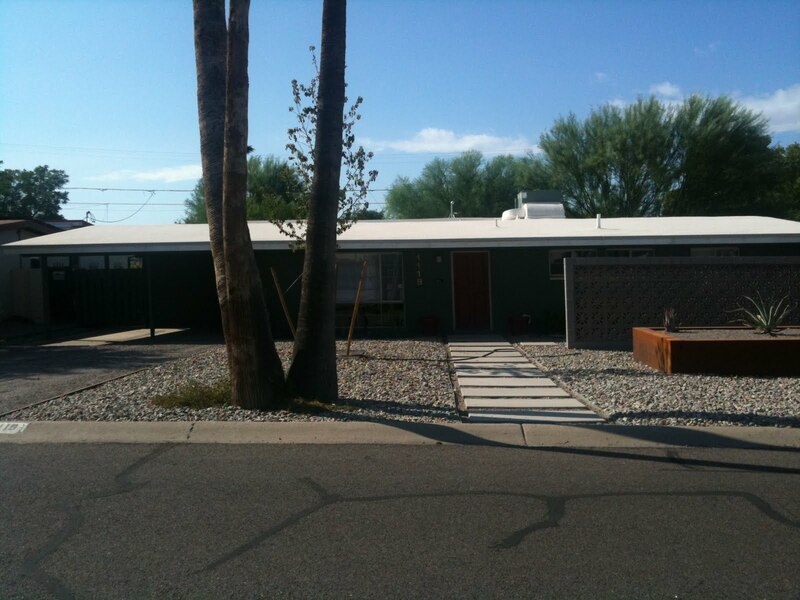 For us this is Fall weather…almost jacket weather  (I’m kidding)….so we decided to embark on a bicycle ride through some of the mid century modern neighborhoods with great little homes. 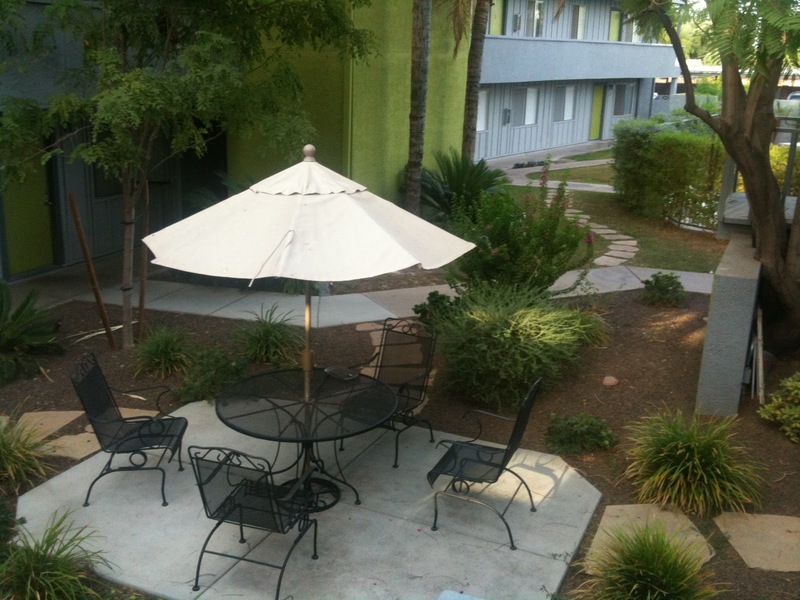 Our destination today was Northwood off 12th Street and north of Glendale. 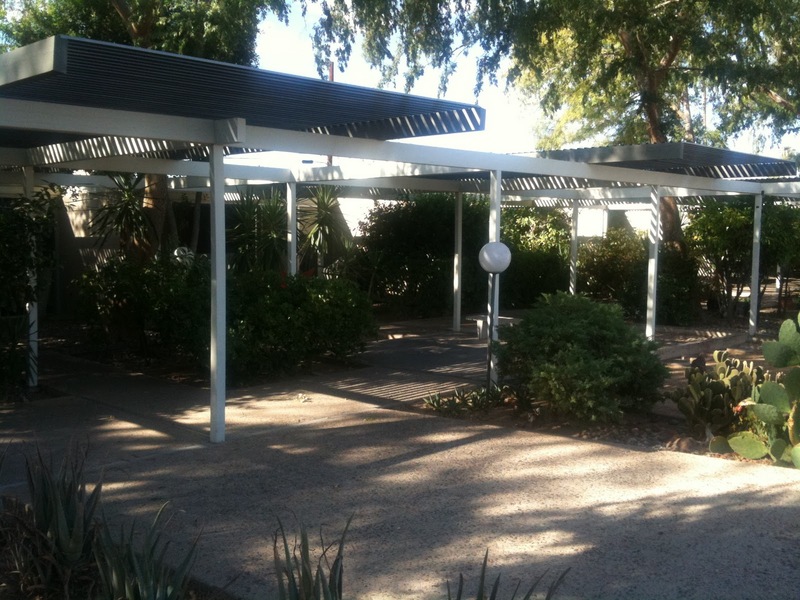 It is an area where Juan grew up AND his elementary school, Simis Elementary, is right nearby. 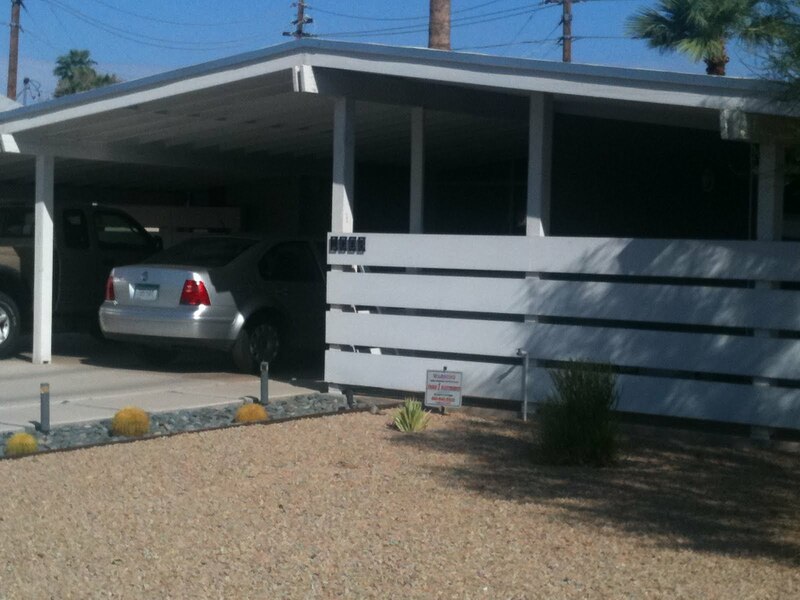 These are “Haver Homes” a wonderful midcentury architect. 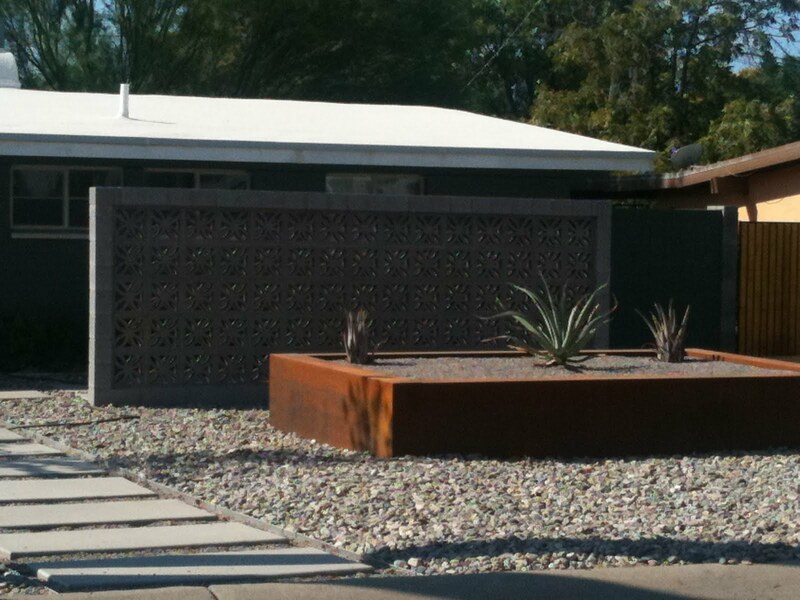 Ralph Haver was a modern architect working in metropolitan Phoenix, Arizona, from 1945 until the early 1980s. 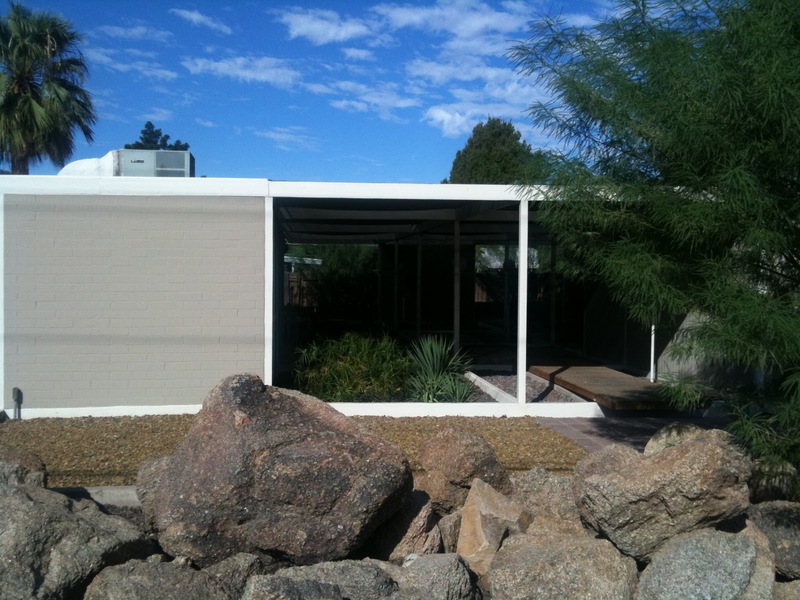 Haver is best known for his Mid-Century Modern Haver Homes, affordable tract housing executed in a contemporary modern style. These Haver homes are prized by designers and do-it-yourselfers alike as modest and modern spaces to renovate. 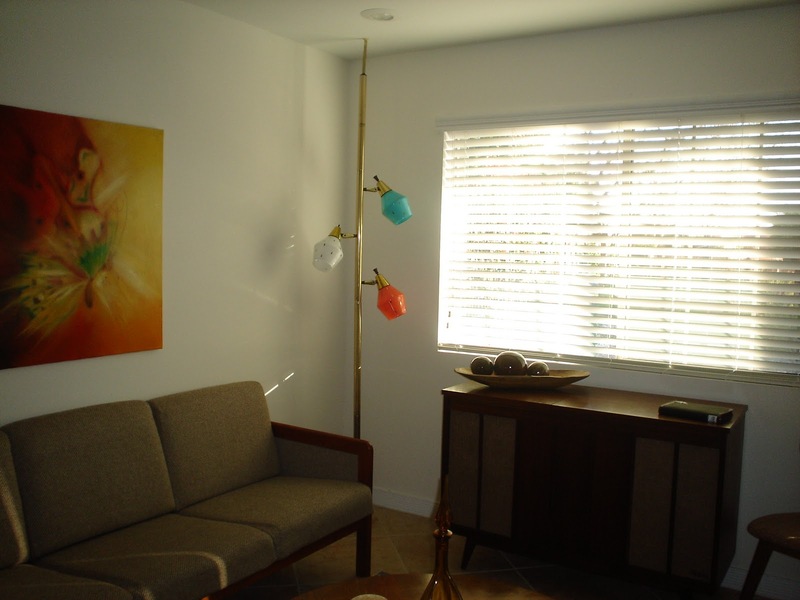 There are many of these treasured homes that couples are purchasing AND bringing back to their original beautiful style they were 50+ years ago. 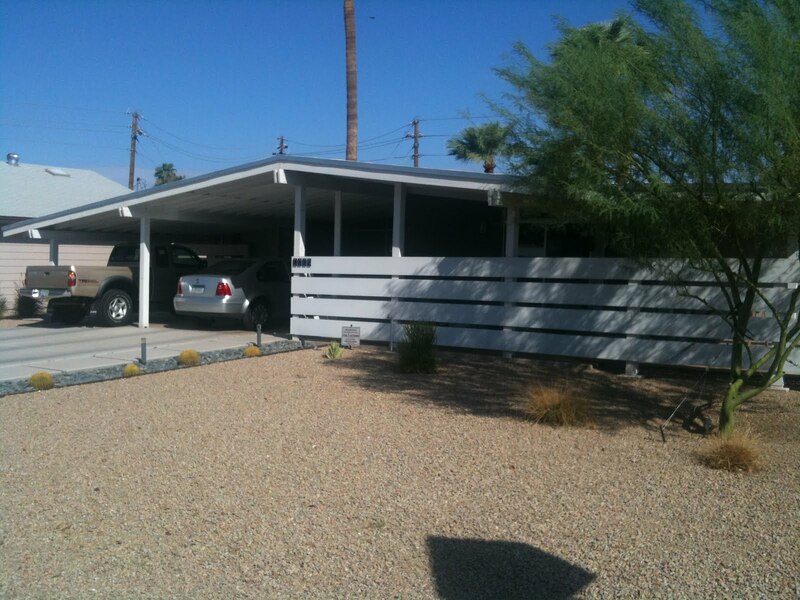 What I love about the Ralph Haver Homes is many of them are not huge homes… small square footage and such style. 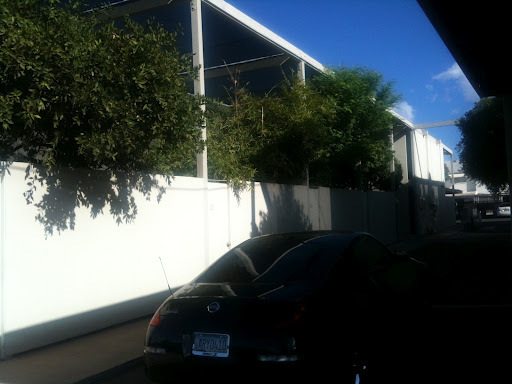 So join me as we cruise through this neighborhood and Juan’s enjoy a trip down memory lane of where he grew up! 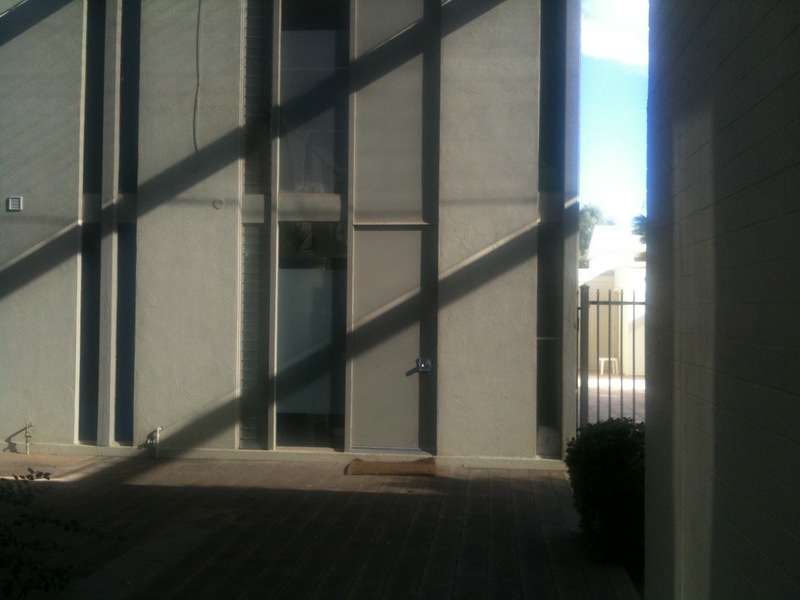 This one has a great little front patio. 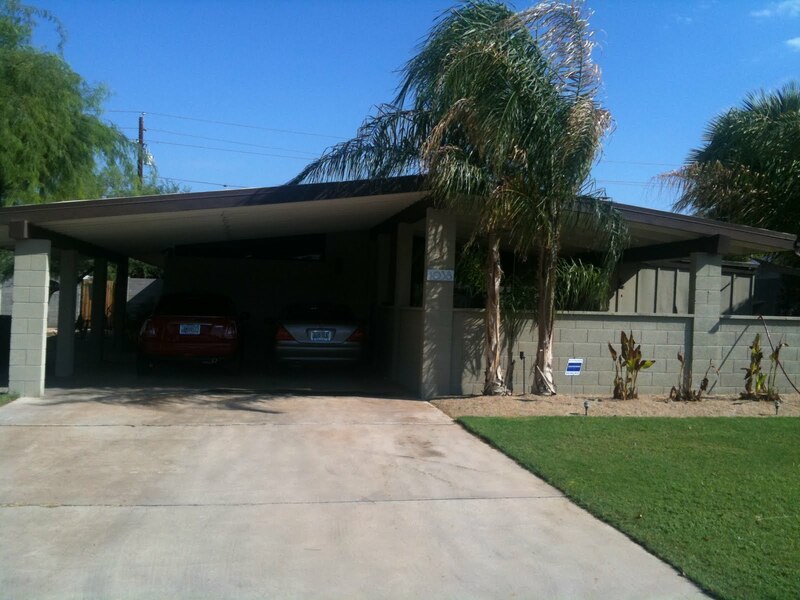 As I mentioned, the original Ad I found comes from a wonderful person here in the Phoenix area that has dedicated herself to knowing, understanding, cataloging etc….midcentury homes. Her name is Allison King. 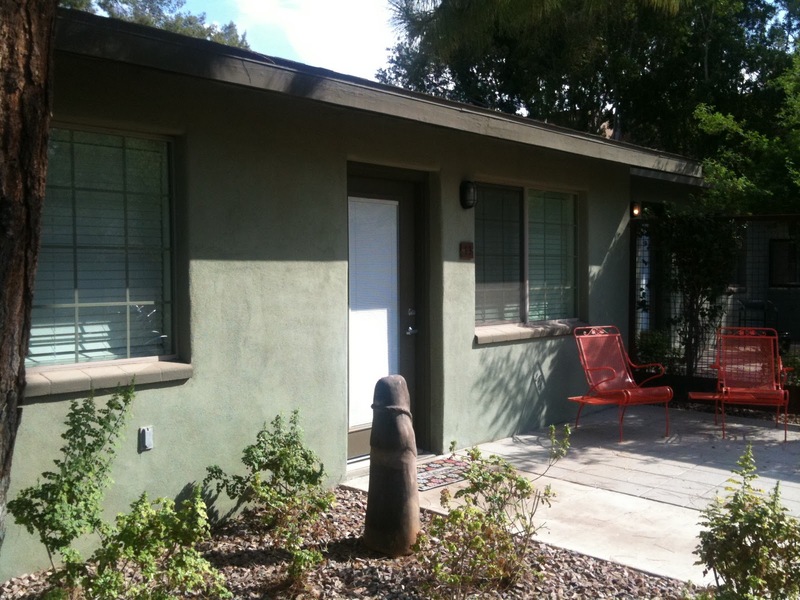 King started the Modern Phoenix website in summer of 2003 as a quick-reference method to catalogue midcentury neighborhoods. 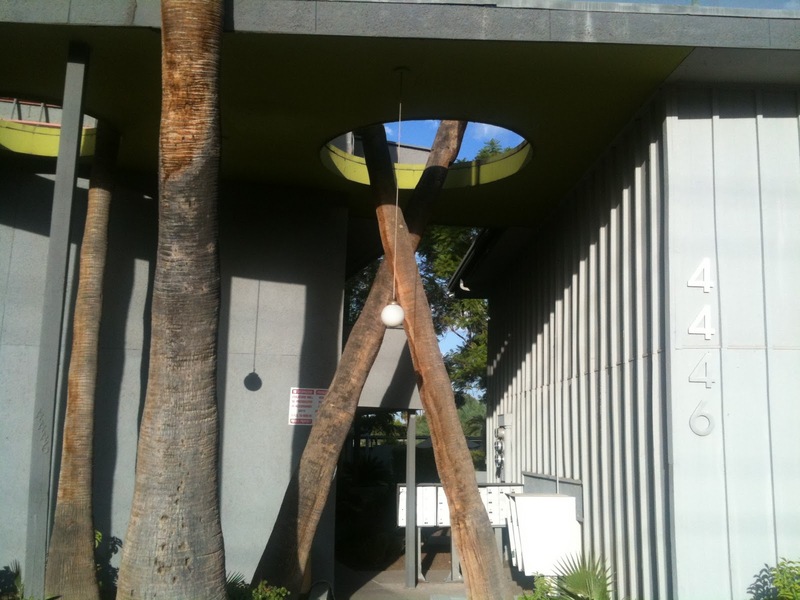 Since then, her site has exploded with research, reporting and activism opportunities, resulting in an annual home tour and Modern Phoenix Week featuring educational and entertainment events. 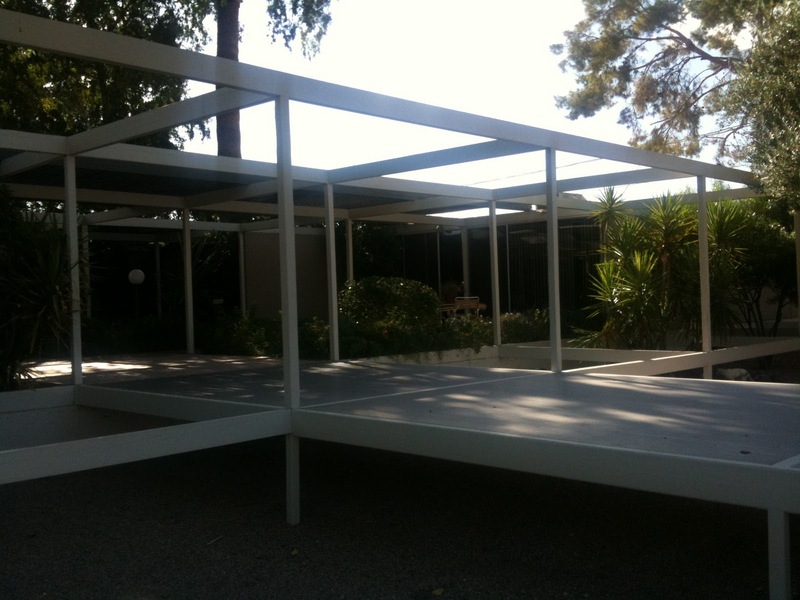 So whether you are a Phoenician or fan of midcentury modern homes, I encourage you to check out her website. She also has a facebook page called Modern Phoenix. I guess I should invest in a good camera for next time! At 16 years old, what were you thinking about? Seriously…what was on your mind? Was college? Having a home? Having no mortgage? Not me! I was enjoying the fruits and labor of Mom and Dad “officially” being able to drive legally. (Okay, I used to sneak the car out at night when my parents were out for dinner or out of town and yes…I had no license). All I was thinking about was the fun I was having driving, friends and family fun…the latest fashion and cool stuff I could buy. Yes, high school was mixed in there but to me that was fun! Loved school and I made good grades but I will be honest with you, I was NOT thinking about my immediate future which was just around the corner as in college…let along buying or having a house in the future. I encourage you to visit their website and see what people are doing out there to live a smaller, simpler and mindful life. In the meantime….please check out this video created by *faircompanies about Austin Hay who is 16 years old and building his future home. It’s kinda funny as I look back on this year and the changes we have made. This time a year ago we were in the beginning stages of discussion about what we are doing? Why are we doing it? And what are we going to gain from it? My “real role” is running a staffing and consulting firm. We place people across the US in all levels and all departments. (A shameless plug, Kellen James). As I digress, Juan and I have talked with countless Managers, Hiring Authorities and people looking to make a move and there seems to be a common goal ever since this economy took a dive…A need for a simpler life….A need for quality time with family and friends as that is what is most important. Going back to my original thought (I know Juan says I have three or four conversations going at once), it was a huge undertaking getting ourselves situated in a much smaller space. 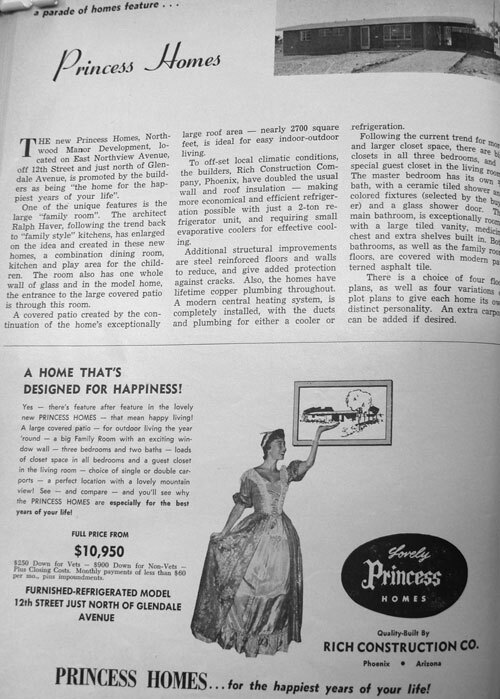 Yet, we are so much happier now than when we were in a larger home. I am not a slave to my house/pool/yard. It is like living in a vacation home! (No not as cool as Ileana’s beach house/Previous blog article) But…it’s close. 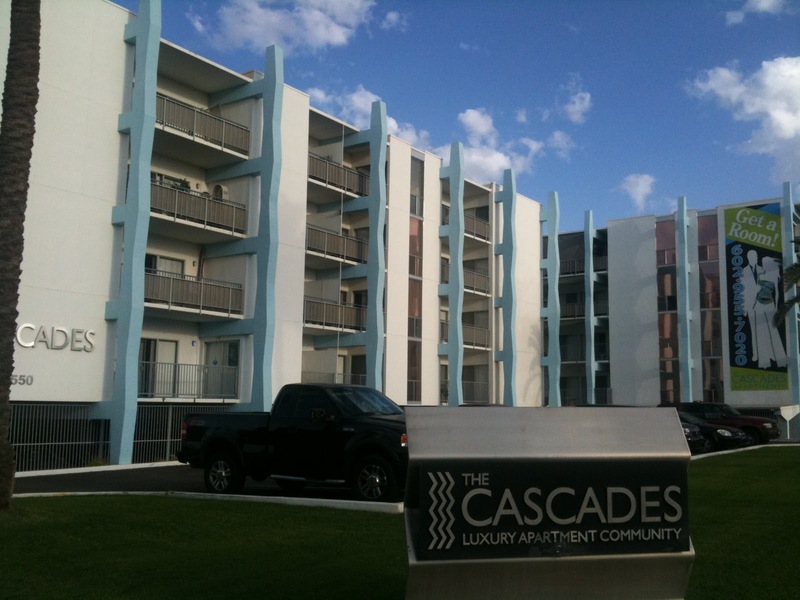 We find ourselves enjoying our home, hanging out with friends and family here. We enjoy creating cool bar-b-que dishes and sitting at our kitchen table with a cup of coffee and just chatting. 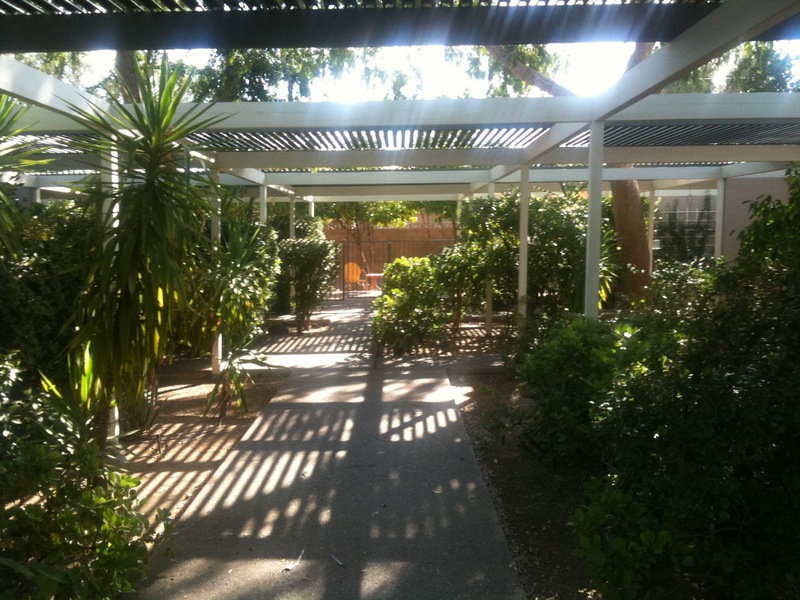 We can step outside (when it is not 114+ degrees) and get on our bikes and cruise the canal trail or walk to several neighborhood haunts and enjoy wonderful cuisine of all kinds. 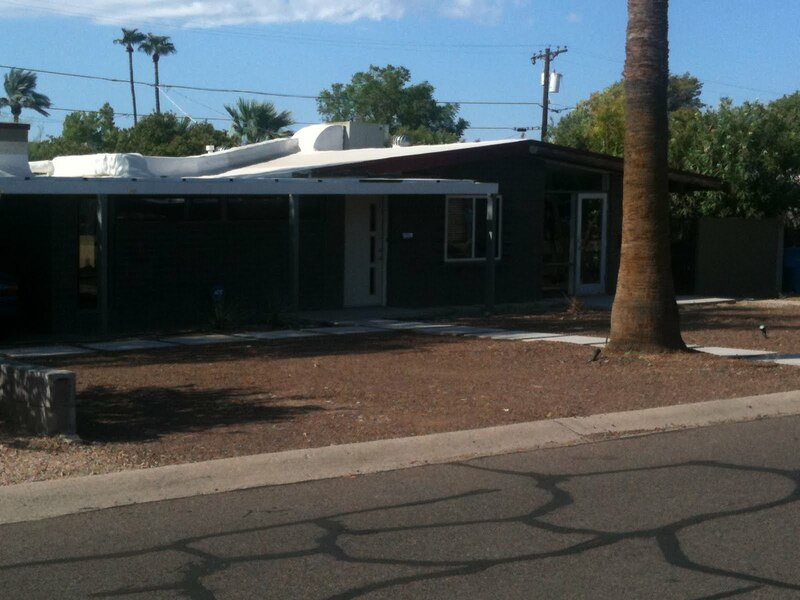 We have an urban space which is very new to me and this area has 71 of these cute 900 sqft “bungalow style homes. There is a sense of great friendship and community here much more than when I was up in the “burbs” where everyone waves but drives right into their garage and shuts the door behind them never to see them until the following morning. We get together as a community for impromptu “happy hour” celebrate a birthday or hang out at the clubhouse to watch a game. It’s truly a community of friendship. If this is the cost of downsizing and moving to the city?….I wished I did it years ago. So now I will sit with Juan, drink a nice cool “Arnold Palmer” and enjoy “Old School Style” listening to records on my 1962 Fisher Electra Stereo. A small “taste” of what I am enjoying! Cheers!